YouTube Will Soon Be the Second Most Visited Spot on the Web. Move Over, Facebook When Is Teamwork Really Important? What’s a trillion dollars worth, anyway? That’s the question being raised in technology news reports as Apple became the first U.S. company to eclipse the 13-digit valuation mark in early August 2018. What are we to make of Apple’s $1 trillion mark and what does it mean for the digital world? Does it matter at all? Apple is unlikely to stop. Fueled by its ubiquitous devices and computers, the company continues to steam along. While iPhone sales have slowed, but continue to drive profits. A larger iPhone X, with a price tag over $1,000 is planned for release later this year. The company has also begun to branch out from hardware. Its accessories – Apple Watches, AirPods and HomePods brought in $3.74 billion in revenue in the most recent quarter. Its Apple Music, App Store, and AppleCare services generated $9.55 billion for the same timeframe. It’s continuing to explore how to bring new technologies like augmented reality to its product lines. There’s also the potential backlash. Apple has stashed millions overseas, avoiding U.S. taxes. It continues to be criticized for its use of foreign labor, especially in China, with poor working conditions. It will not be the last. Apple may be the first to hit $1 trillion, but Amazon may eclipse it shortly. As of mid-August 2018, Amazon had a market valuation of more than $950 billion. Facebook, Alphabet (Google’s parent company), and Microsoft could surpass the mark in coming years. That’s not to mention foreign companies such as Saudi Arabia’s Saudi Aramco, which is preparing an initial public offering that could value the national oil company at as much as $2 trillion. The New York Times noted that the Apple success is indicative of the rise of mega companies that dominate the U.S. economy. Apple and Google provide 99 percent of all software, while Facebook and Google account for 59 cents of every advertising dollar today. Alphabet, Amazon, Apple, Facebook, and Netflix have delivered about half of the S&P’s gains this year. 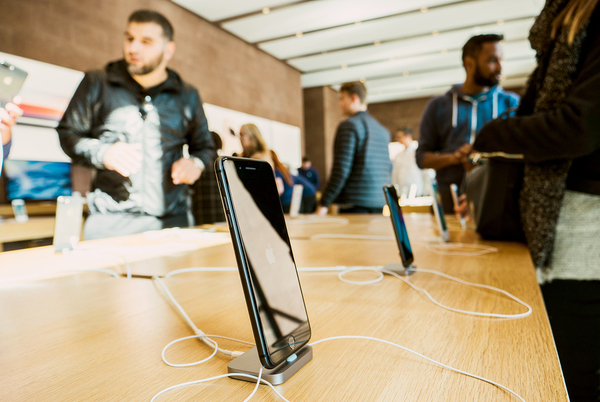 Consumers continue to be drawn to Apple products, as the company continues to grow in the accessories and services portions of its business in addition to its core hardware offerings. For investors, it’s complicated. Individual and institutional investors have a lot of skin in the game when it comes to Apple. The company accounts for more than 4 percent of the S&P index. While some investors may not be able to afford its $200 per share stock price, it’s a good bet that their 401(k)s and other investment tools do. The stakes are high for Apple’s investors, whose portfolios could be dramatically shaped by upturns or downturns in the stock price. For now, the economy is bullish on Apple and other tech stocks: By late July nearly all tech companies reporting quarterly earnings had exceeded analyst expectations. Apple’s growth has been heady and its push past $1 trillion is a reflection on its extraordinary business leadership and visionary products. It remains to be seen what the full impact of the milestone is on the company and the long shadow it casts on the tech sector.